The State must prove that you wrote or composed the threat and sent or procured the sending. This means that you either wrote it yourself, or at least created it and had someone else write it, and you sent the threat yourself, or had someone else do it for you. So, you don’t even have to be the person who mails or emails the threat, if it was done at your direction. The State must prove that the threat was in the form of a letter, inscribed communication, or electronic communication. So, an email counts. This is an extremely dangerous provision as it can ensnare a large group of potential offenders. 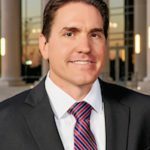 For example, a group of young college kids who have a little too much to drink one night and think it would be funny to shoot off a threatening email from another friend’s computer could find themselves charged with a second degree felony. People communicate so freely through email, social media and other online venues and often make statements that could be construed as a written threat. The written threat does not have to be signed or purport to come from a specific person. In other words, if you send an anonymous written threat and it is tracked back to you, you could be found guilty of sending written threats. The State must prove that the written threat was sent to a person and that person is the person who is being threatened. If you write a written threat about a third person and send it to someone else who is not a family member of that person, the State would not be able to prove that element of the offense. In other words, if you wrote a letter to a friend threatening to harm a third person, you would not be able to be convicted under this statute. The statute requires that you send the written threat to the actual person you are threatening. You can also be convicted if you send a written threat to an individual and do not threaten them specifically, but you do threaten a member of their family. Verbal threats are typically charged under the Florida “Assault” statute, which is Florida Statute 784.011. An assault is an “intentional, unlawful threat by word or act to do violence to the person of another, coupled with an apparent ability to do so, and doing some act which creates a well-founded fear in such person that such violence is imminent.” For example, if you got into an argument with a person and balled up your fists, took an aggressive posture and stated, “I’m going to punch you in the face,” you could be charged with assault. However, if those facts were the same, but the listed victim was behind a bullet proof, locked door, there would be no well-founded fear that violence was imminent. Of course, most of the time, whether there is a well-founded fear that violence is imminent is a question that the jury would answer with a verdict of guilty or not guilty. Assault is a second degree misdemeanor punishable by up to a maximum of 60 days in jail. Notice the huge difference between the maximum allowable punishment under written threats (up to 15 years) and assault (up to 60 days). Clearly, the legislature feels that taking the extra steps to memorialize the threat to paper or email and then to transmit them through the mail or internet is a much more serious offense than making a verbal threat. 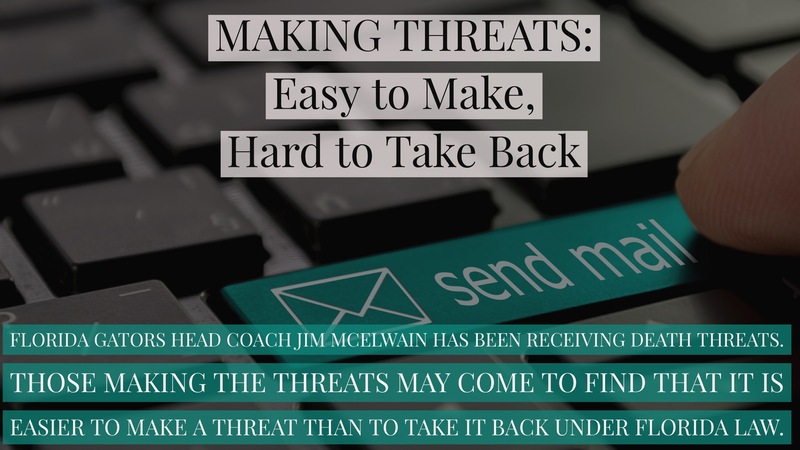 Despite Coach Mac stating that he did not notify law enforcement of the death threats, anyone who sends a death threat or any threat to do bodily harm to a person takes a huge risk. Many times these threats to are made through email or other electronic means which can be tracked back to the person. An arrest for making written threats can lead to a felony conviction, probation, and jail or prison time. This is one of the few offenses where an otherwise law abiding contributing member of the community can make a very poor quick decision without thinking it through and end up paying for it for the rest of his or her life. We see athletes, celebrities and political figures make career changing mistakes through poor social media decisions. The proliferation of Twitter, Facebook, Email and other tools used to vent frustration with the press of a button make it easier than ever to send someone a written threat without thinking. The State does not have to prove that you intended to follow through with the threat or even that you were serious about the threat. They simply have to prove that you made the threat.